Many don't realise that our humble, little boutique has been witness to many floral design creations and is home to the best floral designers in Lidcombe. The design team at Flowers On East have a strong passion for Floral Couture, being in the business of creating fashionable, custom made floral designs in all their blooming glory and pure essence. Our weekends usually consist of bringing blooms to our amazing and loyal customers, with the added flavour of floral design styling for events such as weddings, corporate events, birthdays, christenings, funerals and any other event that needs beautifying by our beautiful blooms! Enter our rustic, aromatic, little boutique and you will be enchanted by our vast variety of fresh, local grown, cut flowers! We also provide fabulous floral arrangements, quirky vases, bright balloons for all occasions, candles, incense, cards and our tasty blend of take-away coffee, as well as cold drinks and snacks. Flowers On East also offers services such as delivery and set up of blooms as well as a free, no obligation consultation with a qualified floral designer. Flowers in Lidcombe, we are your go to Florist! Our operating hours are 7am-5pm 7 days per week. ..Let your dreams for your big day BLOSSOM! 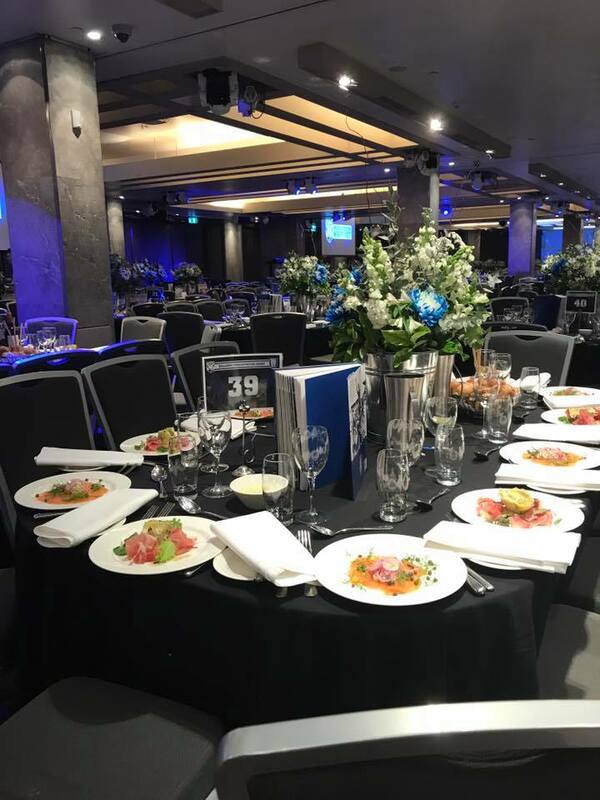 *Photo credit and thank you to The Bulldogs Rugby League Club for choosing us to style their Annual Presentation Night. At Flowers On East we love a fusion of something unique! We strive to provide you with gift options that are sentimental and evoke emotion. We have collaborated with the amazing Michael and Meagan Hadusek, co-founders of "Uppermoda" to bring you a traditional spin on flowers and fashion. As pictured, the gorgeous "Linen Tote Handbag" is handmade with special care by a Croatian designer using traditional methods. A different thoughtful message is sewn into each tote, giving you a moment to reflect - to stop and smell the flowers. The dimensions are 31 cm (width) and 40 cm (height) making it perfect to carry your flower purchases in or to fill it with flowers as a unique, functional and practical gift. This design is also available in a blue & black pattern, making it easy to accessorize with. You could even match any of the other exuberant designs of jewelry, ties and accessories that "Uppermoda" has in store. You can check them out at www.uppermoda.com. The combination of flowers and fashion make a fabulous gift. With the bag retailing at $65 AUD and a bunch of Flowers On East Carnations retailing between $12 and $15 AUD your new found fusion of flowers and fashion is also affordable. You can pop in and pick up your flowers in store, at the round-about on the corner of East Street and Victoria Street East, Lidcombe. Nothing screams Croatian fashion like Carnations! Take home your very own piece of Europe and fill your tote bag (and your life) with flowers..
We like to keep it old school at Flowers On East! Traditional customer service is our priority, we make Floristry fun with a pinch of perfection, real rustic spirit and a lot of vintage charm! Each of our arrangements are personalised with a hand written note, for an authentic and romantic touch. We stock a variety of fresh, local grown, cut flowers. We also provide floral arrangements, vases, balloons for all occasions, candles, incense and of course our hand written cards. An added feature is our delicious Take-away Coffee, as well as cold drinks and snacks. #Flowers Speak Louder ..say it with a personalised card!